Our World Tuesday, Black and White Wednesday, Alphabe Thursday, Little Things Thursday and Haiku My Heart, Haiku Friday. She knows this is a different camera ~ hence the 'quizzical' look, I think. photography but hope you have enjoyed it. Your posted comments are delighting us as always, thanks! The birds are enjoying the feeder. Great bird photos and very nice to see them feeding. I always wonder how such delicate little creatures manage to survive the cold where you are! The photo of your little dog is lovely! Wonderful shots of the birds and dog. Well, at least the birds are sharing the food, right? Do you think Artmuse is really wondering about the camera, or looking for maybe a little treat? So cute. It's always nice to see birds on a feeder - I would like to put one up. And Artmuse Dog is cute, as always! I like watching the birds on the feeder. Great captures. The haiku so well done. Haiku's nice. Love the mention if lights in January...mire brighter days, yes it gives me hope. Great pictures too. I'm not a bird photographer, either, but I like to watch them in the garden - if there are any. You seem to have some nice species there. And I wanted to say it but always forgot: your dog is really cute! Have a nice day! Hello Carol, I always enjoy the birds and your cute doggie.. I am happy to see the days growing longer, pretty haiku! Have a happy week! Love the birds, love your haiku. great bird photos! I'd so love to put one of those feeders out but my dog would go nuts after the bits that would drop on the ground. Another beautiful haiku and digital pic too. Nice photos of the birds, your blog is very peaceful. I like the haiku, they are restful. Nice to see the birds on the feeder! I have exactly the same view of birds hanging on the feeder! That's always nice to see birds on a feeder ! Carol, your shots are gorgeous ! 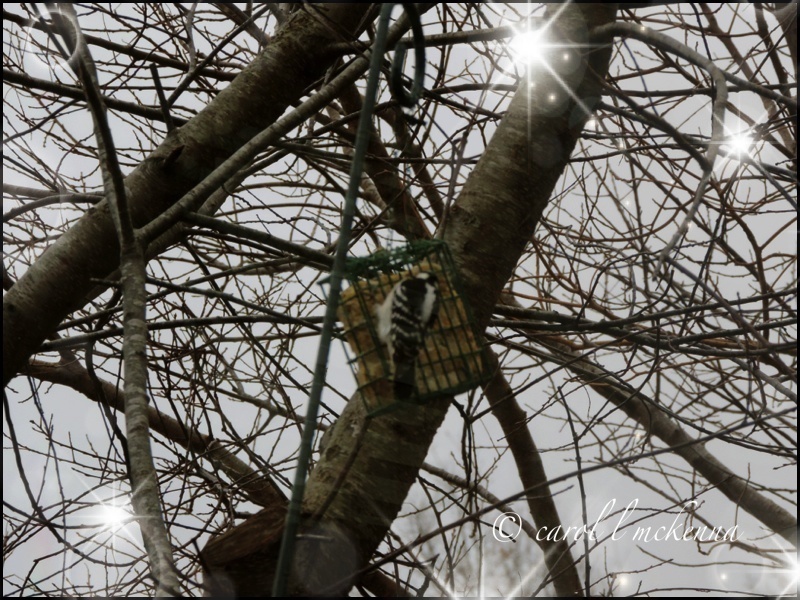 I am sure the birds relish your bird feeder in winter. Lovely to visit. Keep warm and have a wonderful week, and thank you for stopping by my blog. Ha! Love the quizical look! 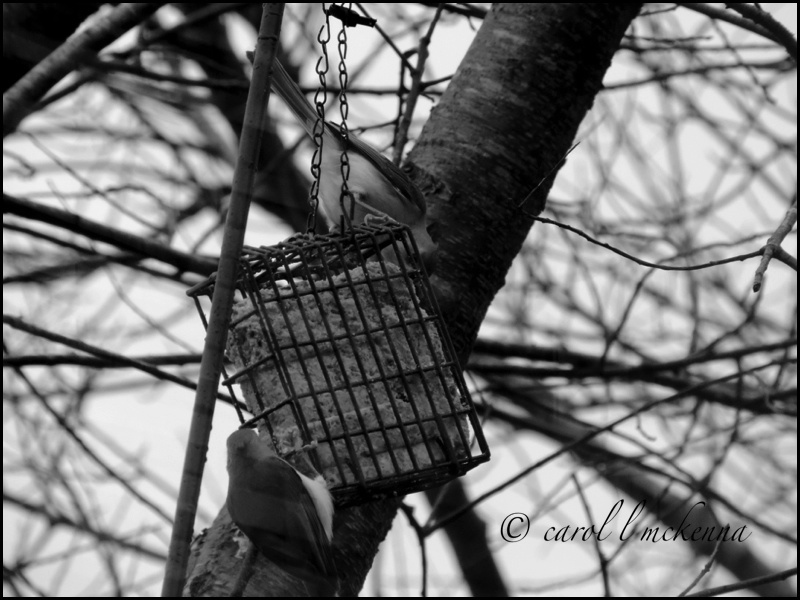 Nice black and white of the bird feeding. These are lovely photos! And you've reminded me that I need to fill the bird feeders. Have a great week! She is so beautifully groomed! I'm having trouble brushing my newbie. She's not used to grooming! Beautiful bird pictures and of course the little doggy is so cute ! Love your dog. She is super cute!! Interesting set of photos this week. 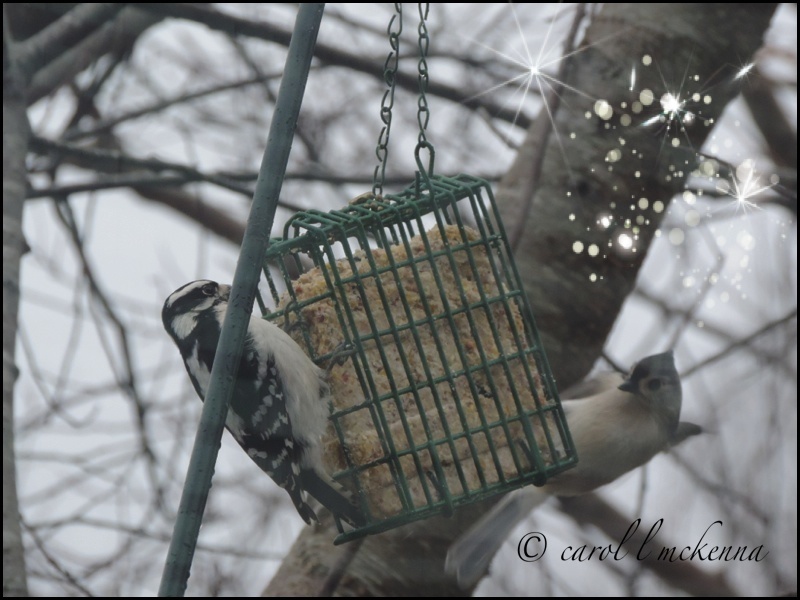 I love busy bird feeders in winter. Cool photos of the birds. You've given me an idea to do something similar with one of the wire cages I have hanging on the tree. Thanks. I love the birds. The woodpecker is beautiful. Have a great weekend! Isn't it lovely, in the middle of a busy day, to stop to watch the birds? Thanks for sharing your moment with the birds! Beautiful nature photo. Love the birds. 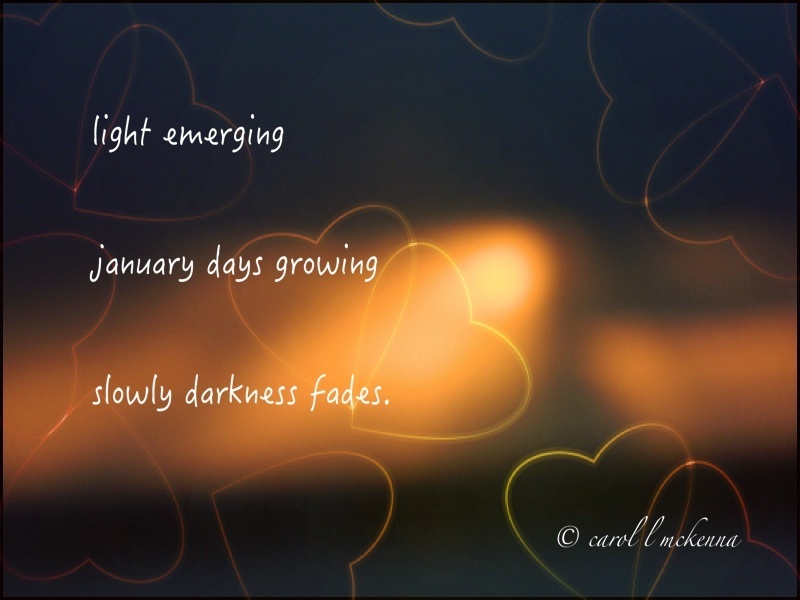 January darkness fades too slowly. Darkness can't fade fast enough for some people, although I rather enjoy the short days and long nights, because they encourage me to slow down. January days growing in the light. January darkness surrounds us, Carol. The winter fog is hovering over our valley. Days go by without good sunlight. We so look forward to warming and February. Your January looks great !! It showed to me that "Art" isu a girl dog! She likes your new camera. I love watching birds at the feeder. so lovely to move toward brighter warmer days together. I always enjoy what you share Carol! 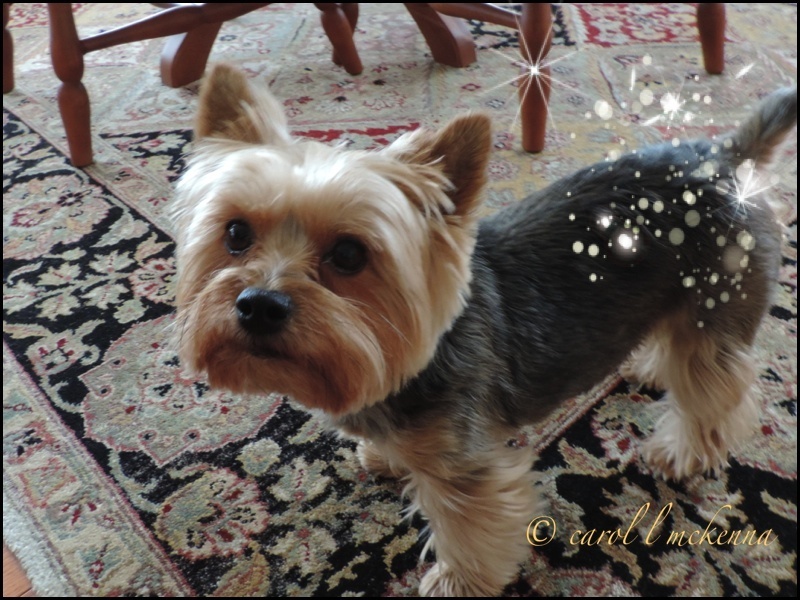 Love the sparkle on your little muse... and the warmth of your haiku... Have a beautiful weekend!